Sorting items by color has many real-world applications. For example, in the food industry, a vegetable sorter requires a color sensor to detect the color of different vegetables to be able to sort them. They are also used in industrial sorting for segregating colored recycled plastic, coffee beans, and car interiors. 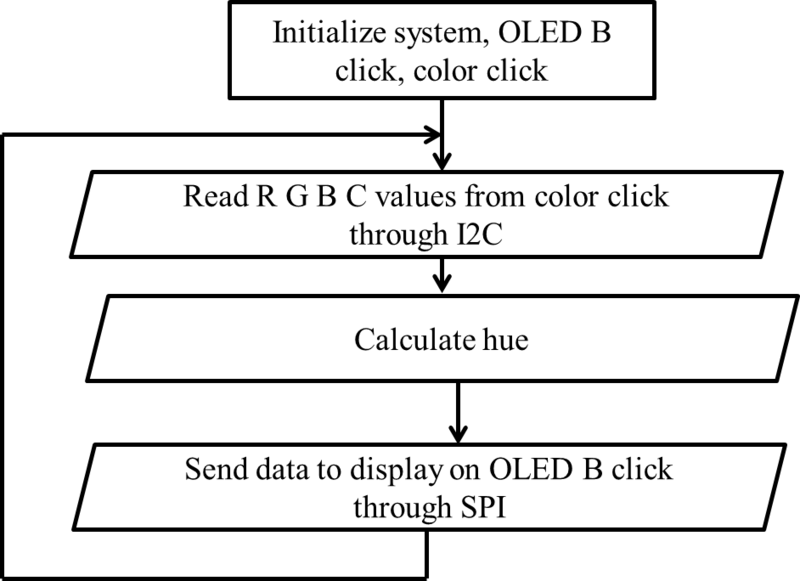 The goal of this project is to demonstrate how you can use a PIC® microcontroller to sense color from a light source or an opaque object and display the detected color on an OLED display. Many industrial applications for color sensing depend on multiple factors (i.e., the number of colors detected, the accuracy of color detected, response time, proximity and brightness of the color source). No need for any jumpers on components 1-6. 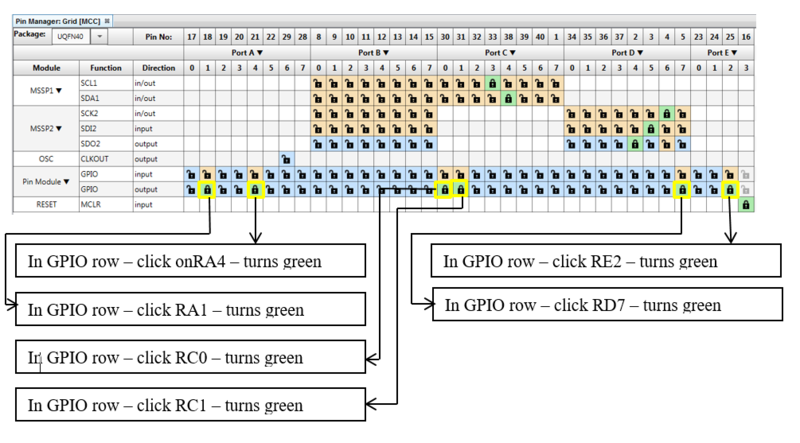 J47: RD6 is connected with the center pin to configure it as the microcontroller SCK pin that connects to the J32 mikroBUS SCK (SPI Clock). 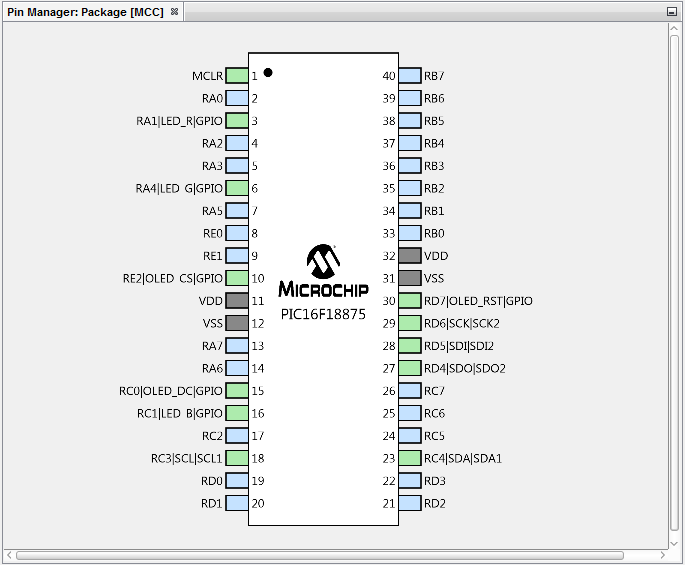 J46: RD5 is connected with the center pin to configure it as the microcontroller SDI pin that connects to the J32 mikroBUS MISO (SPI Master Input Slave Output) pin. J45: RD4 is connected with the center pin to configure it as the microcontroller SDO pin that connects to the J32 mikroBUS MOSI (SPI Master Output Slave Input) pin. No need for any jumpers on components 8-14. J30, J14: The board is supplied with 3.3 V.
No need for any jumpers on component 18. 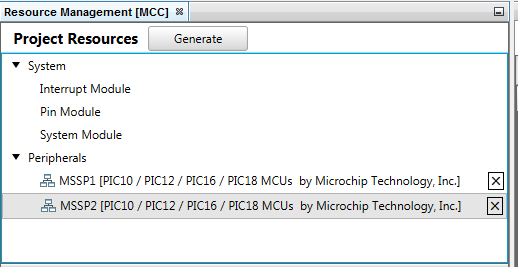 Create a new "Standalone" project in MPLAB® X for a PIC16F18875. 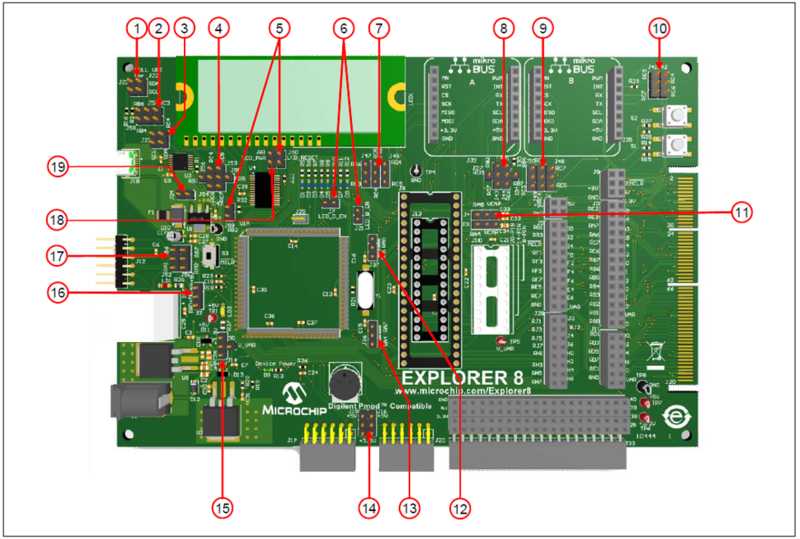 If this is your first time using MPLAB® X, follow the instructions in the following article: Create a Standalone Project. 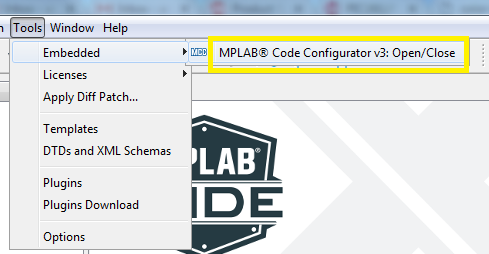 Open the MPLAB® Code Configurator under the Tools > Embedded menu of MPLAB® X IDE as shown in the image below. The System Module needs to be set up. Click on 'System Module' in the "Project Resources" section. 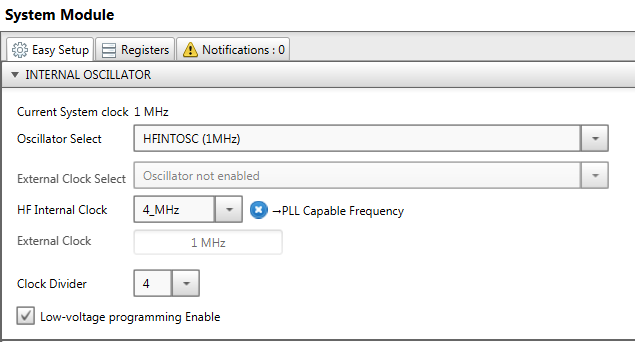 Select the 'HFINTOSC (1MHz)' from the drop-down menu for the Oscillator Select option. 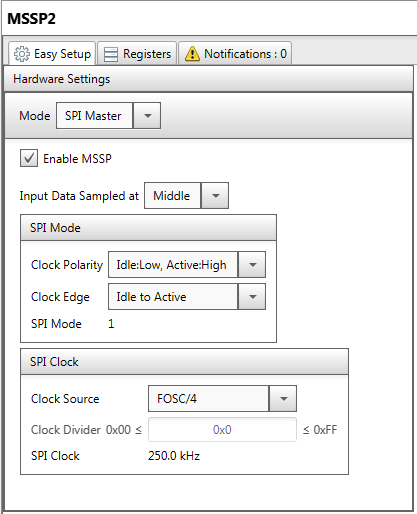 Select the '4_MHz' option from the HF Internal Clock drop-down menu. Select '4' from the Clock Divider drop-down menu. 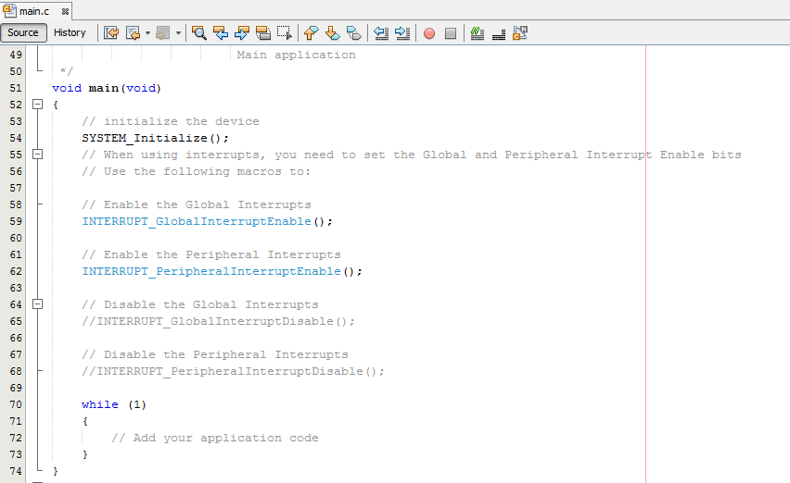 Check the 'Low-voltage programming Enable' selection. This will enable the internal 4 MHz high-frequency internal oscillator as the system clock. Each configuration setting can be changed under the 'Register' tab of the System window. 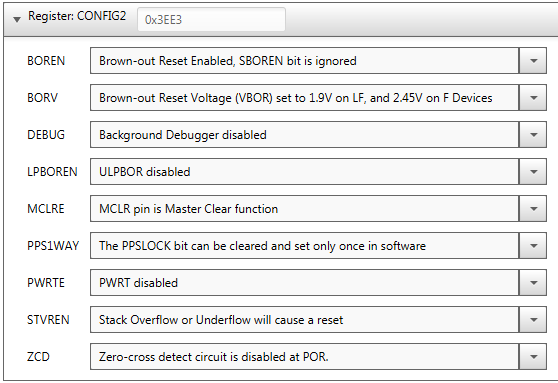 Verify that the MPLAB Code Configurator generated settings are set to the default values shown here. The MSSP1 needs to be set up. Click on the 'MSSP1' label in the "Project Resources" section to make the MSSP1 setup screen appear. 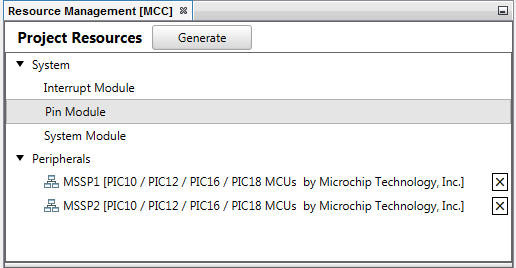 MSSP1 is used for I2C communication between the master PIC controller and the slave Color Click. 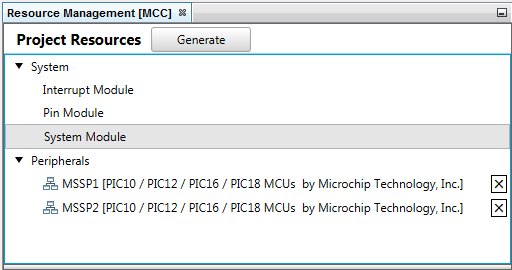 Select the 'I2C Master' Mode and verify the other values are set to the default values shown here. The next step is to setup the MSSP2 module. Click on the 'MSSP2' in the "Project Resources" section shown below. 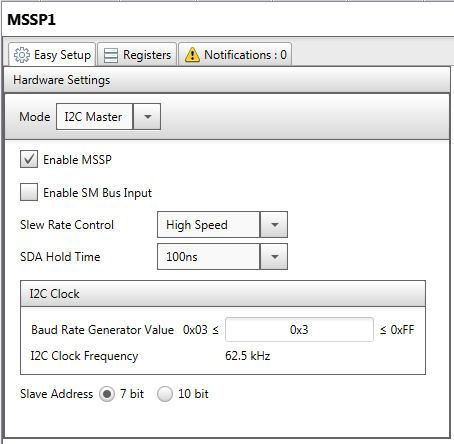 MSSP2 is used for SPI Communication between the master PIC controller and the slave OLED B Click. Select the 'SPI Master' Mode and verify the other values are set to the default values shown here. 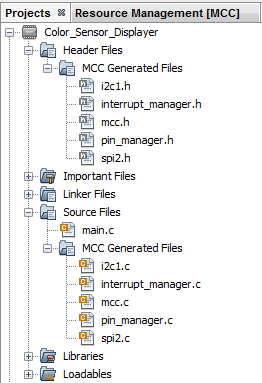 There are multiple pins that need to be set in the Pin Manager window. 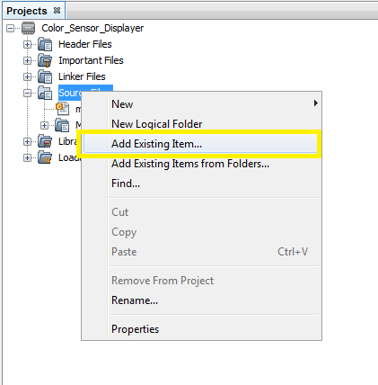 Close the Pin Manager window and then click on 'Pin Module' in the "Project Resources" section. Rename the pins according to the following diagram. To rename a pin, click on the 'Custom Name' for the pin and type in the new name. 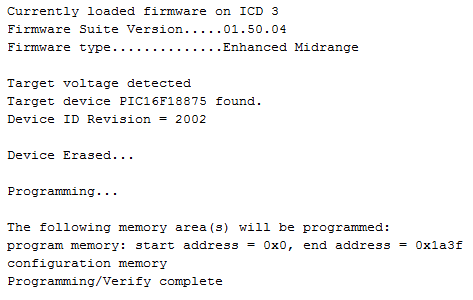 Make sure all the 'Analog' and 'WPU' boxes are not checked. If any are checked, click on the box to uncheck them. There are four files that need to be attached to the project to make use of their functionalities. 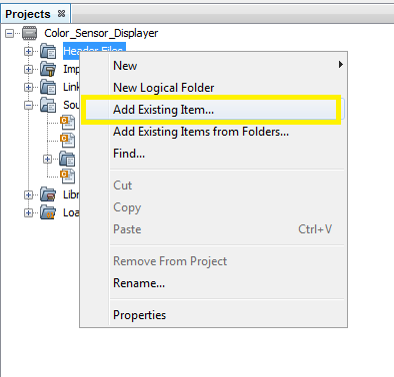 Download the project ZIP file from the "Exercise Files" section of this page and expand the contents. Then move or copy the files oled.c, oled.h, color.c and color.h to the working project folder. The following steps will teach you how to do that. Go back to MPLAB® X IDE v4.01. Right click on 'Source Files' in the 'Project' tab. Right click on 'Add Existing Item' from the drop down menu. Choose oled.c and color.c and click on Select. Now right click on 'Header Files' in the 'Project' tab. Choose oled.h and color.h and click on Select. This will add the files and you can use the functionality that it provides. Note: The file attached to the project has all the snippets together and needs no modification if used directly. 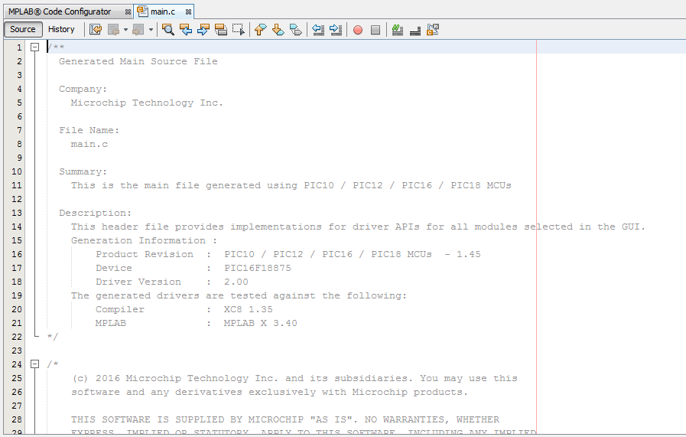 You may also use the snippets on this article to write the code from a new file. Once the file is attached to the project, the OLED display functions can be called to utilize its functionality. OLED_Command() function can be used to call OLED SSD1306 display driver commands for reset, contrast control, and other basic commands understood by the OLED. OLED_Data() function is used to define a character that has to be displayed on the OLED B click board. OLED_Initialize() function initializes the OLED to function properly. A set of commands are sent over SPI data line to initialize the OLED B click board. OLED_SetRow() and OLED_SetColumn() functions set which row and column the character has to be displayed on. 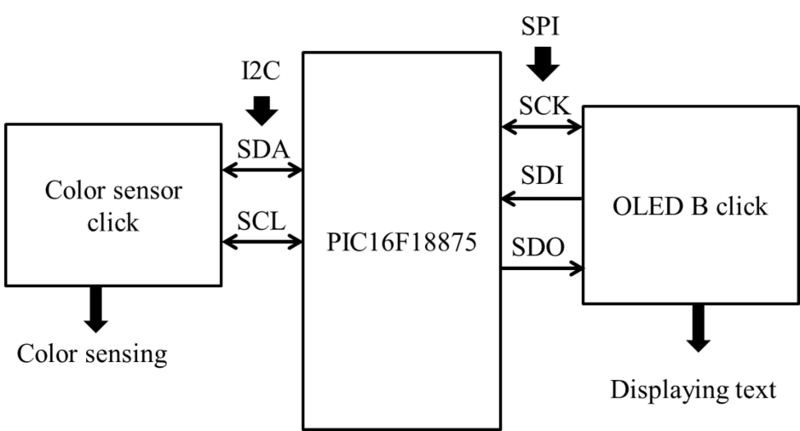 OLED_PutPicture() function is used to define what the complete OLED has to print out or display and to talk to the OLED B Click display through SPI. OLED_Clear() function displays a plain screen. 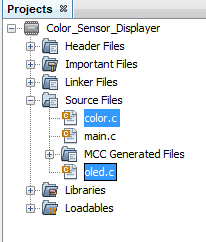 This header file has function prototypes of the functions that need to be used in the oled.c file. It also defines the basic display driver commands that need to be sent to the OLED for initialization and defines what character corresponds to which pattern. 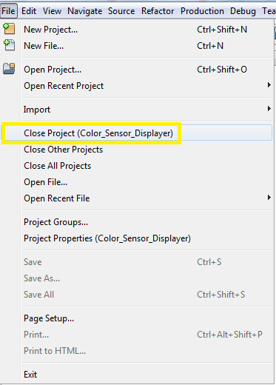 Once the file is attached to the project, the color click functions can be called to utilize its functionality. Color_Initialize() function initializes the color click to perform its basic functions. 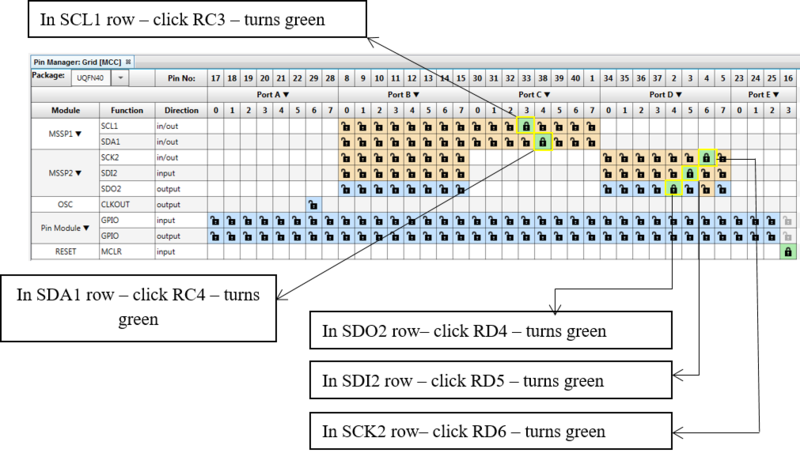 Color_Read() reads the red, green, blue and clear content of the registers that hold the data for the color sensor click using I2C read and write. Read_Register_Data() function reads data from the register located in a specified register in the color sensor and returns the read value. Modify_Data() function modifies characters that need to be printed out on the OLED B display click. Modify_Spaces() function adds blank spaces on the OLED display. To write spaces onto the OLED B click board, a value of 0x00 is written. 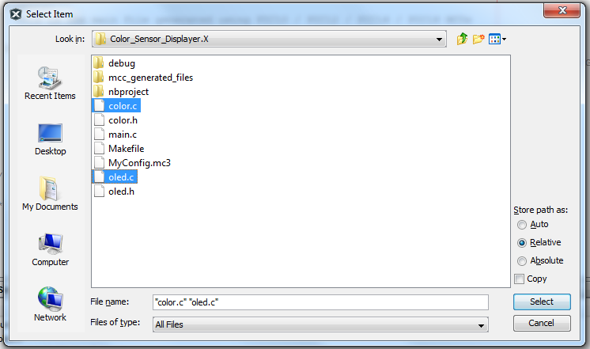 Color_Display() function displays what color is sensed by the color sensor click. Further, the other colors are predicted using the hue value range. 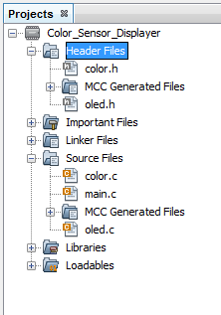 This header file has function prototypes of the functions that need to be used in the color.c file. 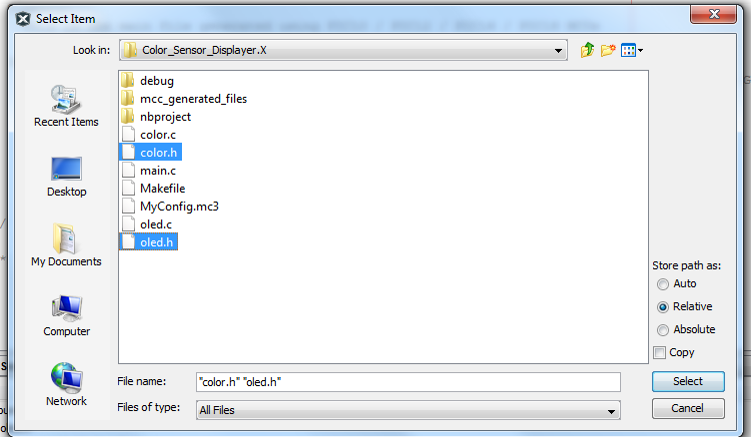 It also declares member variables that are used in the color.c file. The main file needs modifications to incorporate color sensing. 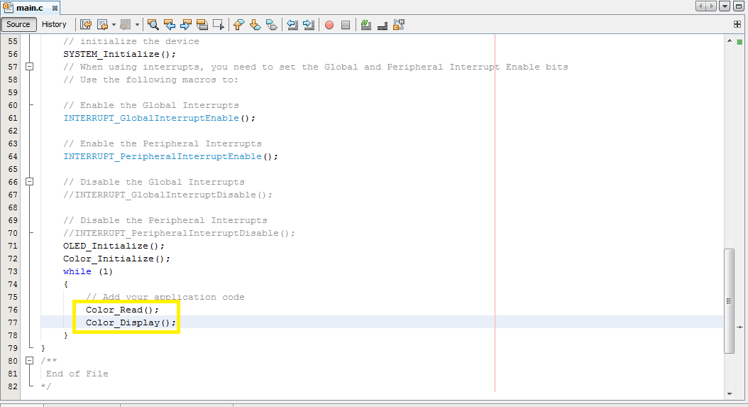 To add them, double click on the main.c file to open it up in the editor window. 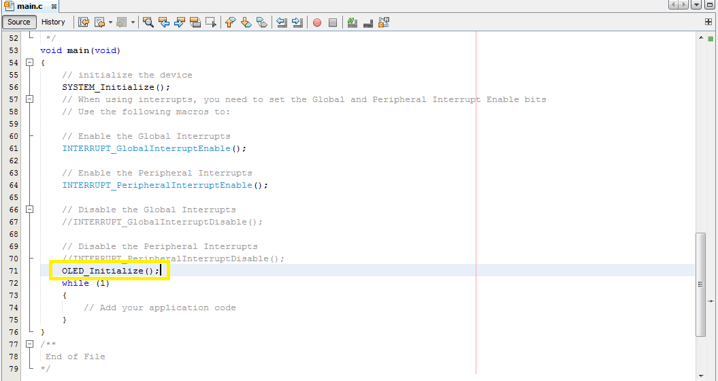 The main.c file requires a few lines to be uncommented for Global and Peripheral Interrupts to work properly. MCC already has the control commands in the default main.c file, but they are commented out with two forward slashes (//). 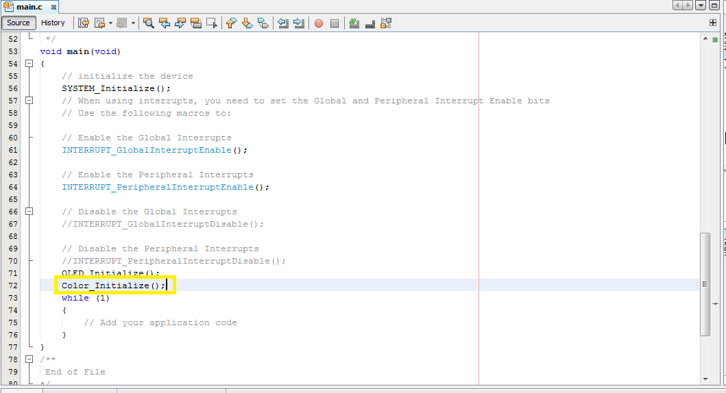 The forward slashes need to be removed to enable these lines of code. The OLED B Click and the Color Click have to be initialized. For OLED B Click to be initialized, call the OLED_Initialize function. For the Color Click to be initialized, call the Color_Initialize function. 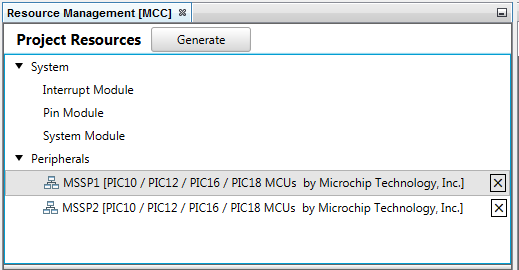 Make sure your project has the programming tool selected and that your development board is connected to power. Click on the Make and Program Device icon. This will build the project and launch the programmer. In the output window, you should see a series of messages and if successful it will end with a Programming and Verify Successful message. The color displayed in front of the color sensor will be identified and the OLED B Click will display the color on its screen with R, G and B values in hexadecimal values. This will run continuously. 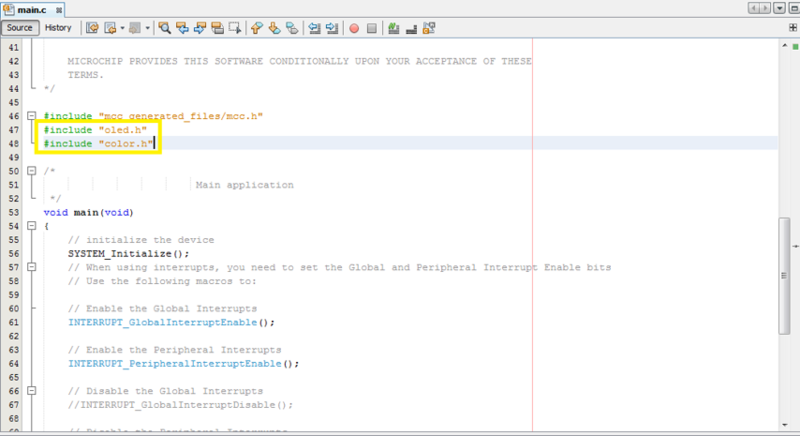 The project can be closed in MPLAB® X IDE v4.01. The project is saved automatically when it is built, but if any changes to files or configuration were made, MPLAB X will ask you to save them before the project is closed. The project can be closed under the File > Close Project. You have now seen how you can use a PIC microcontroller to sense color from a light source or an opaque object and display the detected color on an OLED display.